The San Francisco Bay Area based Power/Thrash Metal band HEXX was formed in 1983, and released its debut album, “No Escape”, on Mike Varney’s Shrapnel Records label in 1984. Since then, the group has been through several lineup changes and musical style variations. The first lineup for the “No Escape” album was: Dennis Manzo (vocals), Dan Watson (guitars), Bill Peterson (bass) and Dave Schmidt (drums). The group’s second effort, “Under The Spell”, was released in 1986 once again on the Shrapnel label, and with European distribution support from Roadrunner Records. For this album Dennis Manzo was replaced by Dan Bryant on vocals, and Clint Bower was added on rhythm guitar. The musical style for this album was still very much Power Metal, but with a hint of the Speed and Thrash influence that would define the band’s subsequent musical style and direction. 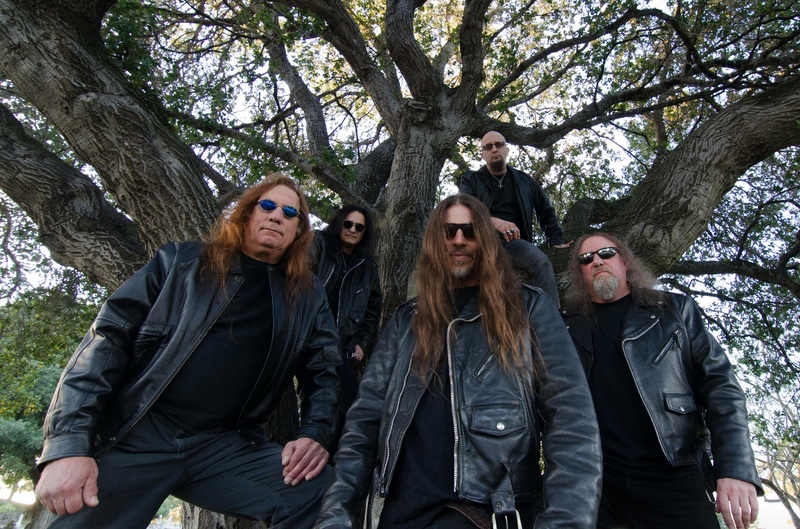 By 1988 HEXX recorded the “Help Your Self” demo demonstrating a shift away from traditional Power Metal to the Speed/Thrash style that was taking over the Bay Area musical landscape at the time. Clint Bower took over on vocals, and Dave Schmidt was replaced by drummer John Shafer. England’s Music For Nations label signed the band and released the “Quest For Sanity” EP in Europe. This album was released in the United States the following year by Wild Rags Records. 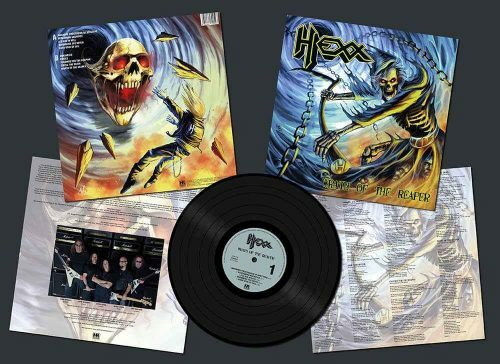 In 1990 HEXX released a single on the Wild Rags label called “Watery Graves” which included two Speed/Thrash bonus track versions of “Under The Spell” and “Edge Of Death” from their 1986 “Under The Spell” album. In 1992 HEXX signed with Century Media Records and released their most technical and speed driven album to date, “Morbid Reality”. A year or so after this release the group disbanded and lay dormant until spring of 2013, when founding members Dan Watson and Bill Peterson reformed with original “No Escape” vocalist Dennis Manzo, and new drummer Gary Gutfeld, to perform at the Keep It True Festival in Germany in 2014. The reformed HEXX recorded the “Up From The Grave” demo that is in the similar Power Metal style of their first two albums. Due to Bill Peterson’s mounting health issues he was replaced by bassist Mike Horn just prior to the bands performance at the Keep it True festival. Mike Horn remains as the bands bass player to this day. After returning home from performing at the Keep It True Festival in Germany, history seemed to repeat itself. Dennis Manzo was once again replaced by Dan Bryant on vocals, and Gary Gutfeld was replaced by original member John Shafer on drums. This line up recorded two new songs, “Burn Or Boil” and “Swimming The Witch” (Both included on the Under The Spell 30th Anniversary Box Set) , and in July of 2015 performed at the Headbangers Open Air Festival in Germany. On their return from Headbangers Open Air, Dan Bryant was replaced by new vocalist Eddy Vega, and Bob Wright from BROCAS HELM signed on to share guitar duties with Dan Watson. That fall, HEXX joined forces with the Gabriel Management Team and also signed a new deal with Metal Blade Records to re-release both “Under The Spell” and “No Escape” on Limited Vinyl, and the “Under The Spell 30th Anniversary Box Set” (Released January of 2016). In 2016 “Morbid Reality” was re-issued on Dark Symphonies Records, and the current lineup re-recorded “Burn Or Boil” which was included on “Tyrants Of Steel” Limited Edition 7 inch Vinyl released on High Roller Records in the summer. In December 2016 HEXX signed a 2 record deal with High Roller Records and released “Wrath of the Reaper’ in September 2017. “Quest For Sanity” and “Watery Graves” are also being re-released on Vic Records with a February 2018 release date. Currently the band is rehearsing in preparation of supporting Wrath of the Reaper as well as writing material for the 2019 follow-up.